The Pentel Arts Sign Pen has a fine, durable fiber tip that's perfect for everything from general writing to drawing, doodling, and adding character to signatures. 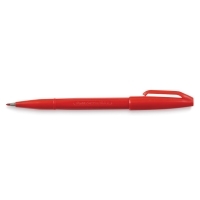 Every pen is filled with bright, intense, waterbased dye ink. 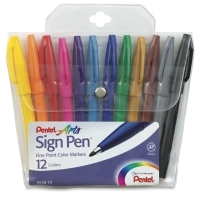 Pentel Arts Sign Pens have snap-tight caps that keep the pens from drying out when left uncapped. Made of 80% recycled plastic, the Black, Blue, Green, and Red Sign Pens are part of the Pentel Arts Recycology line of products. Black, Pigment Ink — This fine-tip pen is filled with acid-free black pigment ink that is fadeproof and water-resistant, with a durable fiber tip that won't break down or "mush." Assorted Colors, Set of 12 — This set of waterbased Brush Tip pens includes one each of Black, Blue, Brown, Gray, Green, Ochre, Orange, Pink, Red, Sky Blue, Violet, and Yellow.